What a trip down memory lane I had, while working with the View Master Reels from Infinity Engraving! I still have my View Master from when I was kid, the reels are in pretty bad shape, as I wore them out, day dreaming where I might want to go, or what adventure I would take! As I pondered what I would create with them, I had a few ideas, but settled on one of my favorite subjects, Steampunk! I just happen to have a mini top hat, that was a dog costume, sitting in craft room on a shelf waiting for the perfect project! I added gray trim, as a band around my hat, using a hot glue gun. I die cut both the big and little rosette from Tim Holtz's die cut set, using black card stock. I assembled them and set them aside to dry. I went back and fussy cut my two sets of wings out and then began assembling my rosette pieces. refer to photo for my placement. I decide some embellishments were in order, I made a organza bow in silver for the hat, added 2 clock buttons to the center of the view master reels and pick 3 cogs and gears our of my stash for extra embellishment on the hat. I thought, Oh, I need a little bit of gold glitzy, so I added bits of a gold neck lace, I had in my stash, one hanging off the wing to the view master reel and one from the tang on the monocle to the rim of the monocle, it added just enough shiny, to compliment my shiny cogs and gears! I then began to assemble the the pieces, one to the hat, added the cogs and gears and lastly the bow, using a hot glue glue. I added the monocle piece to a black straw, using a hot glue glue. If you create with the view master reels, be sure to tag me!! With Mother's Day around the corner, oh, a little fun fact, I was born on Mother's Day, May 12 1957! What a Mother's Day gift I was! I am a Mother to a wonderful son, and Grand Mother to his two sons. My Mother is soon to 84 in May,so much to celebrate in May! 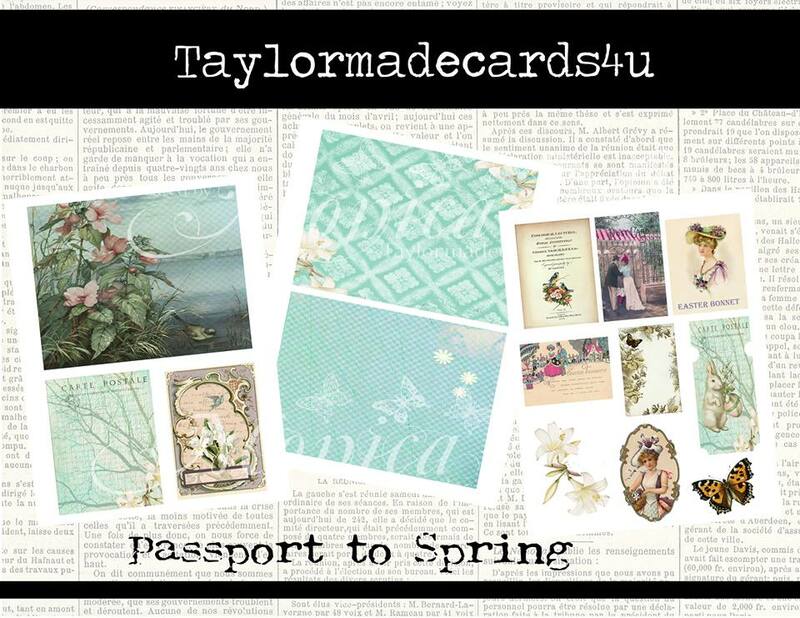 A gift made with My Mother's Garden Passport, will be the perfect gift! 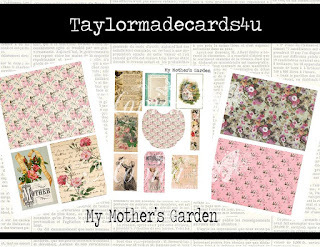 My goodness, the beautiful tags and bits could make a birthday card, Mother's Day gift, or a thinking of you gift for a friend! 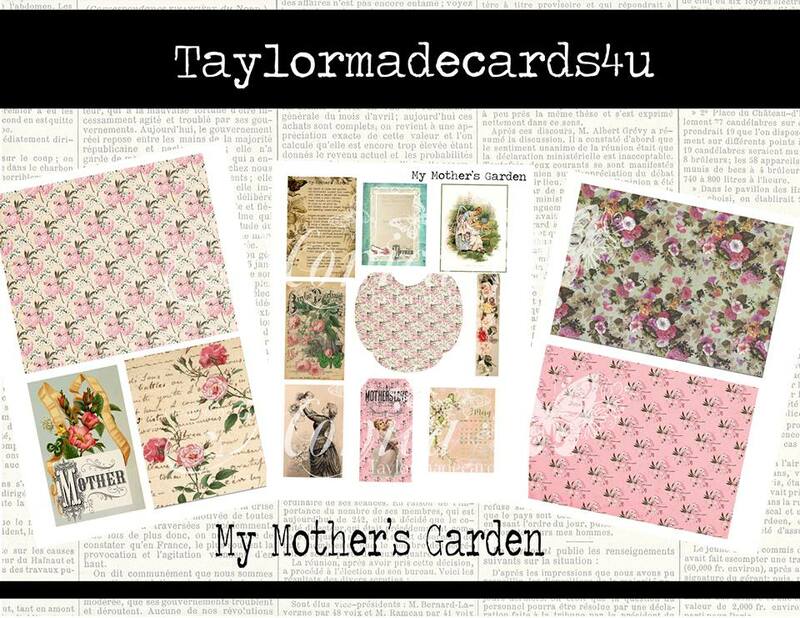 I fell in love with Taylormadecards4U, My Mothers Garden Garden Passport Kit! 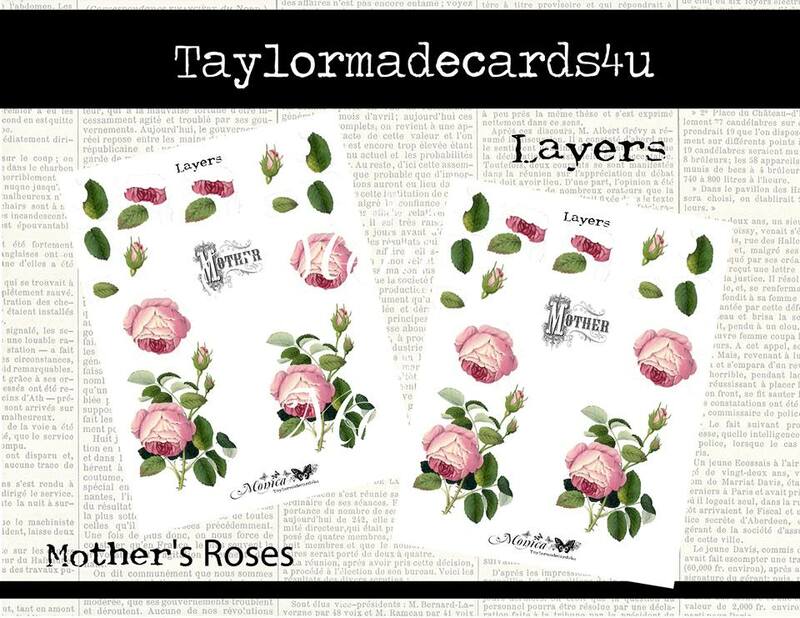 and Mothers Roses kit is a perfect compliment! The sky is the limit with these beautiful images. The link above is to Monica's new one stop website! You can find it all there, be sure to visit! I wanted to create a project that would show off all this kit has to offer. I decided on a loaded envelope, with paper lace, and inked edges. I also added a rosette on a straw, for a little extra elegance. Spring has sprung in northeast Ohio! I have been busy working in my flower beds, preparing for a beautiful season of color, which was the inspiration for my project for Funday Friday Challenge Blog! 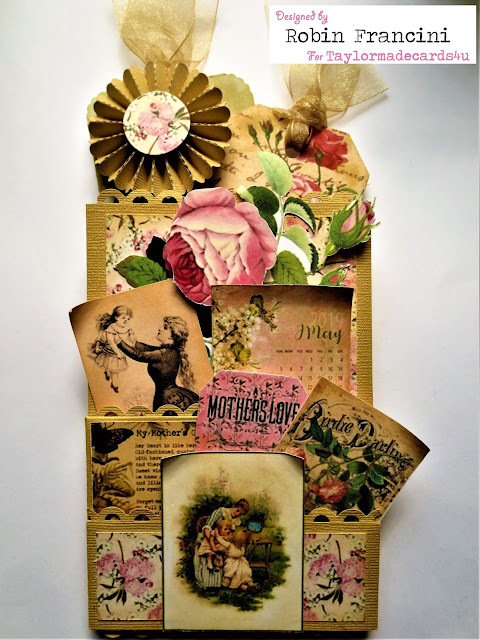 I decided to create to create a mixed media small canvas using the rose buds from The Cutting Cafes Beautiful Roses Set. I began my project by adding color to the rose buds using Distress Oxides in colors Spiced Marmalade, Fossilized Amber. I stamp the color on my non stick mat and the spritzed with water, taking care to mix the ink with the water to create a water color. I water colored the buds using the spiced marmalade from the base working towards the center fading it out. I then filled in the top of the bud using fossilized amber. 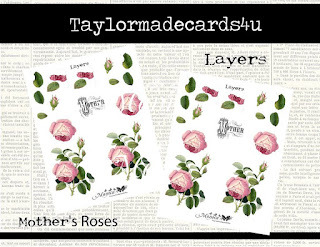 Water color the stems using a light green ink. After the buds were dry I went back in with a little spiced marmalade on a eye shadow applicator and blended it for a darker color at the base of the bud. Set aside to dry. Add more orange and yellow to your work surface adding Fired Brick, spritz with water, mix well. Using a paint brush water color the top 3rd of the canvas with Fired Brick , add orange and yellow to completely cover the canvas. I then went back in with a tissue and dabbed off the colors here and there,added extra texture, set aside to dry. Fussy cut the buds out, by then your canvas should be dry. Using a pallet knife and a stencil, I used Believe Script stencil 6 x 6 by Balzer Design. Holding down the stencil, cover it in with a mousee, I used Tonic Studios Nuvo Mousse in Spring Green. Carefully remove and clean up the sides of the canvas. I added a little mousee to the top and bottom of my canvas for added texture. Now do to the same to the rose buds. After the canvas has dried, assemble by adhering buds and then wrapping the canvas a few times with with cotton string, I used DMC Cotton Perle # 8. I gathered up more string and made a bow, tie it on. Give the project a try! and make sure to tag me in it! Thank You for visiting, check back often, and as always, thank you for our kind comments. I have some exciting news to share, I have been chosen to design for Infinity Engraving! I am so excited to be working with this wonderful group of creatives and Infinity Engravings wonderful and unique products, where the sky is the limit! I began my project by painting the box , using acrylic paints doing so in two steps. First coat of the first step was a warm brown that I brushed on all pieces, inside and out covering each piece completely and let dry. Second coat I used a beige, lightly brushing here and there, being sure to add enough, to add a contrast, but not enough to cover the pieces, and let dry. Step Two consisted of using a warm amber, which I diluted with a little water on my work surface, lending the paint to be a little more workable on the inside, of one side of my embossing folder, which has cogs and gears. I painted on the amber on the embossing folder and the "stamped" the design everywhere, taking care to move the folder, in different positions to add random cogs and gears. Let dry. The last step of step 2, I used a bright shiny gold acrylic paint, which I diluted the same as above and used a mottled dot stamp, only this time, I used the paint as if it was my stamp pad, and then stamping all over the box, while moving my stamp in different positions, to add interest. Let dry. To give the box a little more texture, I used a doily stamp and a walnut colored ink and added the last layer to my box, stamping all over the pieces, taking care to move my stamp as in the above instruction. I repeated the process, on all the pieces to give the project a cohesive look. I die cut some cogs out and applied the same paint and ink procedure to them to create some "hair". I added a die cut cog and gear corner piece out of a reddish brown piece of stock and blended walnut ink stain over the top to add some dimension to the piece. From there is was time to embellish and put the box together. I used small brass brads for the arms, and add a brass bigger brad to inside of one cog for added color, and also, the bit if metallic that is known to show up in steampunk pieces! Thank You for your interest and I appreciate your kind comments. I think Spring has sprung in Northeast Ohio, or at least I hope it has! My daffodils are up, just about ready to bloom, and my crocus are a bright sight of purple! As I was working in my yard, preparing my flower beds, I could hear off in the distance and going by on my street, the humming of motorcycles, a very sure sign of spring! Which lead me to my inspiration for this months design team project for Get Creative Challenge Blog. I chose to work with Ike's Art digi stamp "Afternoon Ride" Lavender seemed to be the perfect color for the motorcycle! After coloring the motorcycle with color pencils, and blending in a Black Soot background using Tim Holtz Distress Inks. I die cut the word Adventure from Tim Holtzs die cuts and embossed it 3 times with lavender embossing powder for some interest and texture, framing the project in a floating frame. Thank You for your interest, and be sure to check out the Get Creative Challenge Blog and play along! I have a bad case of cabin fever! I am so ready for spring to spring ,LOL. 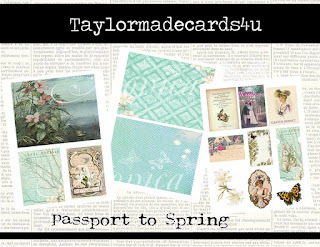 I am even more ready after working with Taylormade4u Passport to Spring! Such beautiful images that all work well together. I created this one of kind stationary box and cards. I used the bottom of box that had cards packed in it, that I happen to have in my stash. I am so excited that the colors on the box match the beautiful colors in this set. I have recently been chosen to design for Jo's Scrap Shack! This my first project and post for Jo's Scrap Shack Challenge Blog using Sparkle and Sprinkles Bonnet Bouquet. With spring right around the corner I was inspired to create a up cycled project, using a shadow box frame minus the glass, I had in my stash! I began by painting the frame with good old white acrylic paint. After the frame dried, I added inked edges and a little color using walnut stain ink. While waiting for the ink to dry, I created a background on water color paper using color burst inks, by sprinkling the colors on and then spraying the piece with water, picking up water and respraying till I liked my back ground. While my back ground was drying, I fussy cut the bonnet bouquet out, and the single flower, I then began putting my project together, I gave my project interest by using foam tape on the back on bonnet to raise it up off the background. I matted that all on a piece of 110 # card stock and popped it in the frame. Added ribbon and the single flower, to front of the frame , for a one kind, spring piece ! Thank You for visiting again, comments are always appreciated, and I thank you for your continued interest and support.